Lancashire have confirmed they have signed Yorkshire and England fast bowler Ajmal Shahzad on loan for the remainder of the 2012 season. Shahzad had earlier revealed the move on Twitter and could make his debut for the Red Rose at Sussex on Wednesday. The 26-year-old was told that he was free to leave Headingley last week. "Great feeling to be back in cricket," Shahzad said on Twitter. "Appreciate Lancashire having me on a loan agreement till the end of the season." Lancashire head coach Peter Moores said: "We are delighted to bring a bowler of Ajmal's quality into our squad. "He will join a strong seam attack, giving us the depth needed to compete on all fronts. "He is known for his competitive nature, which will fit perfectly into the set-up at Lancashire." The Huddersfield-born player will be the first to switch from Yorkshire to Lancashire since batsman David Byas put plans to retire from cricket on hold and joined the Red Rose county in 2002. 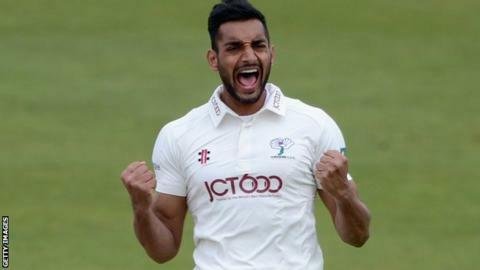 And Lancashire will be hoping Shahzad's arrival can spark a change in their fortunes, after losing three of their first four Championship games of the season, the latest a 185-run home defeat by Notts. He has played one Test for England, taking four wickets against Bangladesh in 2010, as well as 11 one-day internationals and three Twenty20 matches. And he will be hoping the quick step-up from Division Two to the top-flight of the Championship can help revive his international career.